In a Deck of Cards, all the thrills of a real Escape Room! 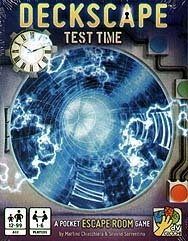 TEST TIME is a pocket Escape Room for a group of friends (but playable solo). Dotter Thyme wants to put your skills to the test will you be up to the challenge? While Doc explains his project, he accidentally pushes a button: and alarm goes off, and heavy shutters descend on the ways out, sealing the lab. Doc falls into a trap door and the room falls into darkness. Are you able to solve the unique puzzles of the room and find a way out in time?